Make the dairy aisle one of the last stops in your shopping trip so the items you choose do not become warm before you get home. Make sure dairy products and eggs are cold when you select them. Examine containers for leaks or other damage. Check “sell by” dates. The “sell by” date is the last date a product should be offered for sale. This date allows you a reasonable length of time to use the food at home. Some products may also include “best if used by” information. This is the last day the manufacturer expects the product to be good to eat or drink. Go directly home and refrigerate your purchases as soon as possible. If traveling longer than 30 minutes, place your dairy products, cheese, and eggs in a cooler with ice. After using dairy products, close the containers tightly. Don’t allow dairy products, including raw eggs, to remain at room temperature for longer than necessary – never more than 2 hours. Some types of cheese require constant refrigeration and others do not. In general, cheese with high moisture content, such as ricotta or mozzarella, should not be left out of refrigeration for longer than 2 hours. 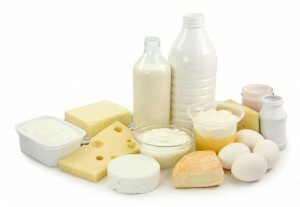 In general, dairy products are pasteurized to eliminate bacteria and make them safe to drink or eat. (Raw milk cheese may be aged 60 days instead of being pasteurized.) After pasteurization, it is important for all dairy products to remain under constant refrigeration to prevent the growth of harmful bacteria. Take these precautions when shopping and at home. Don’t drink any beverages or eat any foods that contain unpasteurized milk. Keep milk and milk products refrigerated. Shelf-stable milk can be stored at room temperature due to a special processing system. Refrigerate after opening. Don’t return unused milk, cream, or other dairy products to their original containers. Opened butter should be covered in the refrigerator. Before freezing butter, wrap each package tightly in foil or plastic.